Often, these items are found near a building wall or on the ground under or near a vehicle that has been boobytrapped or rigged with an IED. Security forces should receive training on what to look for, as they could head off a detonation, serious injuries and many fatalities by being knowledgeable and sharp-eyed. 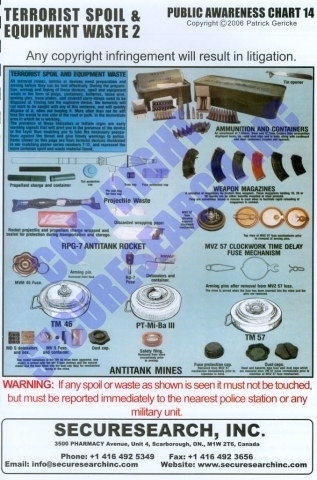 This poster, and its companion poster part 2, show many examples of terrorist spoil and waste. The items can also be of crucial evidential value in doing bombing investigations and cutting the supply channels of certain critical materials from the source to the terrorist. This poster is an excellent reference tool used to create awareness of seemingly insignificant but critical items of evidence.